Product #21639 | SKU TP-DCOL-BI50HO | 0.0 (no ratings yet) Thanks for your rating! With excellent colour rendition due to the 576-LED array's high CRI of 95, the dedocolor FELLONI 50° High Output Bi-Colour LED Light from Dedolight is designed to work in the most demanding situations. 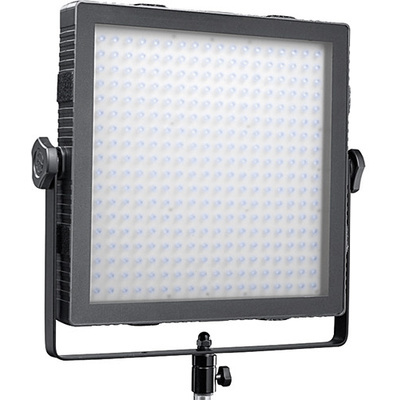 This model features a colour temperature of 3,200-5,600K, making it quick and easy to make adjustments to the colour to match existing lights or lighting conditions. Also, even with an output of 1520 lux at 3', the light is extremely efficient, with a power consumption of 24 W. In addition to these features, the dedocolor FELLONI has a weather-resistant design that will keep it functioning when a little rain gets on it. The light can be powered with a universal 100-240 VAC power supply or V-Mount batteries, and it has a D-Tap input. There is also an on-board dimmer that is removable for use with the included 8' remote cable. The front frame of the FELLONI is magnetic for use with filter holders. Included with the light is a distance diffuser that softens light without reducing output too dramatically.